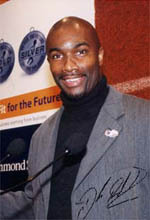 This is Derek Redmond as he is today. Derek has also played basketball for England. He coaches and advises athletes at Birchfield Harriers and has even played rugby union for Coventry RFC and Stowe RFC. He is also a much sought after member of the Professional Speakers Association. Derek also runs his own business Olympex Sport, specialising in high quality gym equipment. Thank you to ALLSPORTS photography for giving us permission to use these photographs of Derek.